A girl named Ida was born February 4, 1918 to a comedian father and actress mother in England. 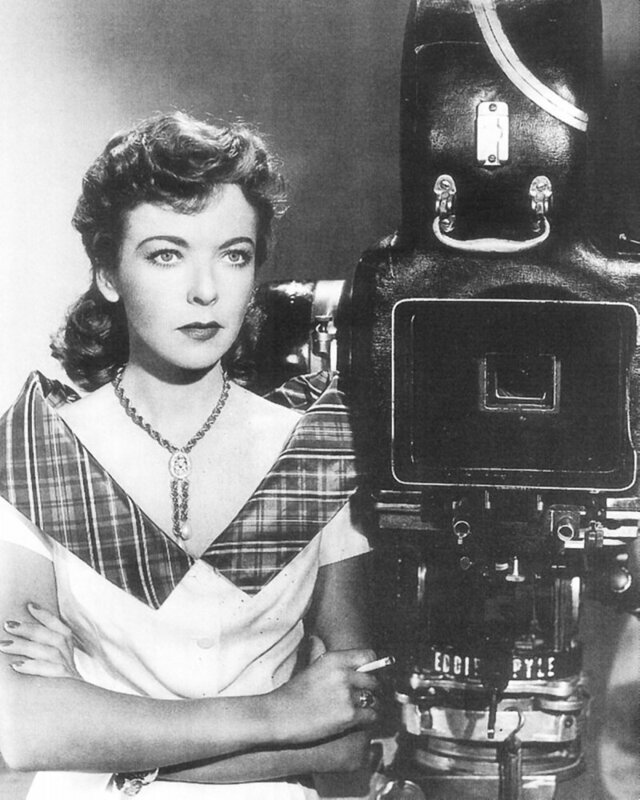 Though her parents encouraged her to become an entertainer, none of them knew that she would become the Ida Lupino: a Hollywood star, writer and pioneering female filmmaker in a male-dominated industry. Ida’s career began on the stage, where she first appeared in school productions as a child. She landed her first big screen role in 1931’s The Love Race, a British comedy directed by her uncle, Lupino Lane. In 1933 she came to America, and by the end of the decade, she had over 25 film credits to her name. Her acting career, which eventually branched out into television as well, amounts to a total of over 100 titles, the final being the 1978 crime drama My Boys are Good Boys with Ralph Meeker. Ida was an extremely talented actress, giving her strongest performances in dramatic roles. But she didn’t stop with an on-screen career. In the mid-1940s she took up an interest in directing and began observing the entire film making process. Her first directorial effort was an uncredited contribution to Not Wanted, a 1949 drama of which she took over production when director Elmer Clifton suffered a heart attack. Ida was one of very, very few female directors of her time and was only the second woman ever to be admitted to the Director’s Guild. She became the first actress ever to produce, direct and write one of her projects. Other directorial efforts including 1951’s Hard, Fast and Beautiful – a sports drama about a tennis prodigy – and 1953’s The Bigamist, a drama in which Ida co-stars with Joan Fontaine. Ida, ever the multi-talented filmmaker, worked as a contributing writer on a number of scripts. Never Fear (1949), The Hitch-Hiker (1953), Outrage (1950) and Private Hell 36 (1954) were co-written by Ida and second husband Collier Young. She also contributed to Paul Jarrico’s screenplay of Not Wanted . Like her acting career, Ida’s directorial and writing careers eventually expanded to include television gigs. Lending her writing talents to Screen Directors Playhouse, Four Star Playhouse and Thriller, she also directed episodes of The Joseph Cotten Show: On Trial, 77 Sunset Strip, Dr. Kildare, The Twilight Zone, Bewitched, Gilligan’s Island and even a few episodes of Alfred Hitchcock Presents (“Sybilla,” 1960, season 6; “A Crime for Mothers”, 1961, season 6)! Ida Lupino is, without a doubt, one of the greatest Hollywood stars that ever lived. Her immense talent showed in all of her artistic pursuits. She wasn’t afraid to break with convention by doing “men’s work” on set, covering controversial subject matter and pursuing every single project with determination and passion. Ida may not exactly be a household name with the modern audience, but with two stars on the Walk of Fame and a world of fantastic films and television episodes for fans to explore, it’s certain that her talent will never be forgotten. Share your favorite Ida films/projects in the comments! Hard to pick a fave Lupino film, but I think I’d have to go with “They Drive by Night”. I love the scene where she finally goes crazy. Her performance in that film is so great. I found the film as a whole a bit inconsistent in terms of mood but she was perfect in that role. Cool article, Lindsey! Private Hell 36 has some really good content (especially the title! ), but for surpreme noir greatness, check out The Hitch-Hiker…one of the cruelest bad guys in William Tallman you’ll ever see in film, noir or otherwise. I’ll add to my watch list! Thanks! A great actress. With the intensity she gave to her work it’s easy to see why she was called the poor man’s Bette Davis even if that’s not the most flattering term. I love Bette too but Ida was able to reign her mannerisms in more often making her filmography more varied. My favorite of her films is the noirish The Man I Love. She flip and sassy and sorts out all kinds of trouble that her family gets into all the while dressed in some eye catching outfits. A close second is The Hard Way, incredibly the only film she ever won or was nominated for any major award for, the New York Film Critics Circle Award, that’s the danger of being consistently good, it becomes expected so you get passed over. There’s the wonderfully atmospheric Ladies in Retirement and the lovely Deep Valley, where she gives a gentle quiet performance. As far as her later career goes, she and Robert Preston steal every single one of their scenes as Steve McQueen’s parents in Junior Bonner. A nice change of pace came with Pillow to Post, a knockabout comedy she did at her peak for a change of pace. It’s not a great film or even an undiscovered gem just a run of the mill comedy but it’s nice to see her cut loose plus it has Sydney Greenstreet in the cast, always a plus. Of the films she directed I could watch The Trouble with Angels once a week although it was far different from all her others which dealt with gritty social issues. I still have a few to catch but I did like Hard, Fast and Beautiful where Claire Trevor was customarily great and The Bigamist. Previous Previous post: DVD collection update + a few announcements!